SI Ramsbottom was formed in 1952, sponsored by the Bury Club. There were 27 founder members. We now have 19 members. 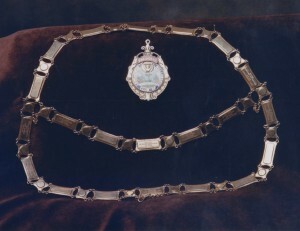 It was decided that the President’s badge should incorporate the crest of the Urban District Council of Ramsbottom showing the town situated in the valley, with the towers, Peel Tower and Grant’s Tower. The badge also shows a weaving machine, a printing machine and a ram’s head encircled in blue..
We aim to provide a warm welcome to prospective new members. We are primarily a service organisation and we try to get a representative of each chosen charity to speak to us. But we do have some speakers who talk or demonstrate on less serious matters. During the past few years, these have included jewellery, candles, hats and fans. To raise money to donate to our charities, we need to do some fund raising. There are some events that occur annually such as the charity evening play by the Summerseat Players at the Theatre Royal in Ramsbottom. We share this with the Rotary Club of Ramsbottom and it is always thoroughly enjoyed by members, families and friends. In June/July we sell Strawberry Treats to the businesses and offices around the town and do the same with Christmas Treats in November/December. In addition, each year there are other social events. Whether it be a Casino Night, a Race Night, a Burns Night, a Fashion Show or any other evening, friendship is assured. We raise monies, enjoy ourselves and work hard. The Club provides reception services once a month at Bury Hospice. We are there from 9.00 to 5.00 in 2 hour slots each month on a rota basis. Apart from the benefit to the Hospice of having reception staffed by volunteers, we have found it to have had a fringe benefit for ourselves. We get to know other members much better than we might normally. At our club meetings, we have a second hand book stall. This has proved very popular. We recycle our holiday and bedtime reading at a nominal cost. If you live or work in or near Ramsbottom and are interested in the work we do, please use the ‘contact us’ link or ring Barbara on 07814055155 to learn more about our organisation.